Debuted back in 2014 for the first time, the Acura TLX was the result of the combination of two different models—the TL and the TSX. Acura tried, at the time, to launch to the market a more composed and competent sedan than earlier models, and they succeeded. The truth is that the sales numbers were great and this is one of the reasons why there is a new 2018 Acura TLX SH-AWD Tech, this time with a more sporty look. Looking at the exterior, the Acura TLX SH-AWD Tech has a lot of changes starting in the front. Instead of the old “beak” grille, the 2018 TLX SH-AWD Tech now comes with a more visually appealing mesh grille, providing this sedan with a beautiful nose. Even though there are only 5 colours to choose from, you may have a hard time figuring out which exterior colour you prefer on the 2018 Acura TLX SH-AWD Tech. Each of the available colours—Crystal Black Pearl, Lunar Silver Metallic, Modern Steel Metallic, Obsidian Blue Pearl, and Bellanova White Pearl—are all suited very well to this new sedan. One thing we need to say is that we are really impressed with what the new 2018 TLX SH-AWD Tech has under the hood. 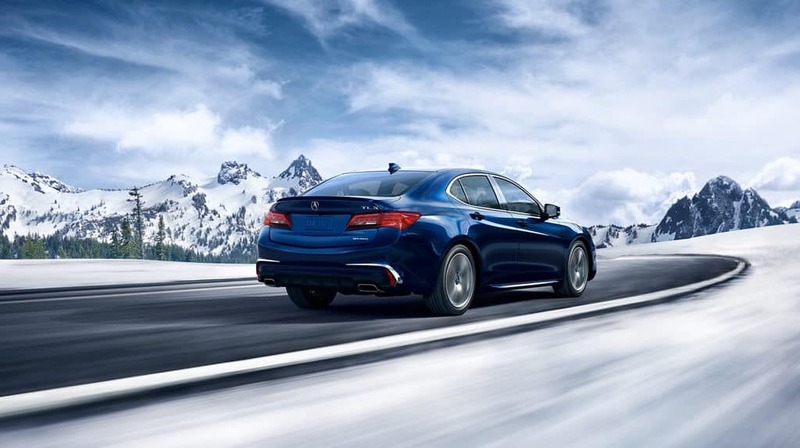 The TLX SH-AWD Tech comes with a 3.5-litre direct injection SOHC i-VTEC aluminum-alloy V6 engine that is capable of producing 290 horsepower and 267 pound-feet of torque. This amazing engine is combined with a 9-speed automatic transmission with Sequential SportShift paddle shifters. This powerful combination gives the vehicle an impressive caliber of handling. View our inventory. In terms of fuel economy, the 2018 Acura TLX SH-AWD Tech is also remarkable. Estimates put it at 7.7 L/100 km for highway driving and 11.4 L/100 km in the city, with a combined fuel economy of approximately 9.8 L/100 km. Inside the cabin, you will also be amazed at the finishes that the 2018 Acura TLX SH-AWD Tech includes. The first thing you’ll notice is the quality of the materials used. The interior features top grain perforated premium Milano leather. The seats are finished for both elegance and durability, with advanced frames providing support for sharp cornering. Inside the 2018 Acura TLX SH-AWD Tech you’ll also find the Acura Premium Sound System which includes an AM, FM, and SiriusXM tuner, MP3 compatibility, and is equipped with 7 speakers and a subwoofer. Some additional features include a USB device connector, Apple CarPlay and Android Auto, and even hard disk drive media storage. View the 2018 TLX SH-AWD Tech on Acura Canada.